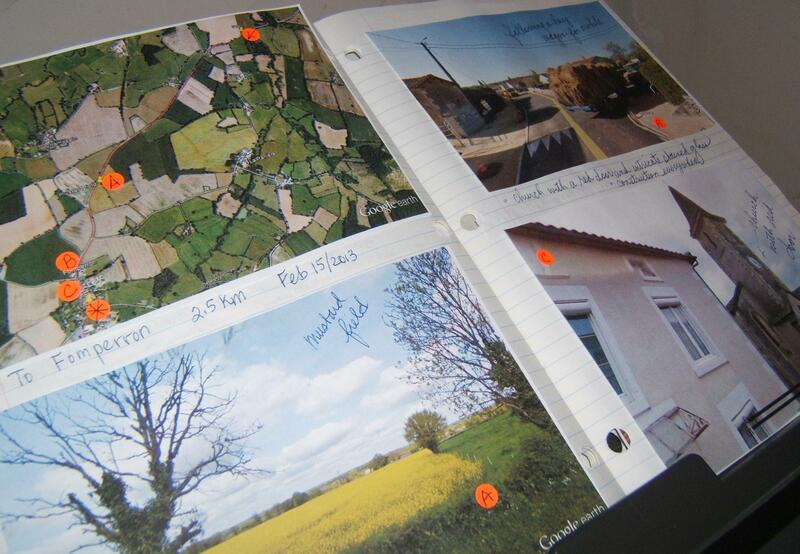 I’ve now completed the second phase of my virtual bike trip through central France! In this phase, I travelled on my stationary bike from Sanxay to Exireuil, a distance of almost 18 km. 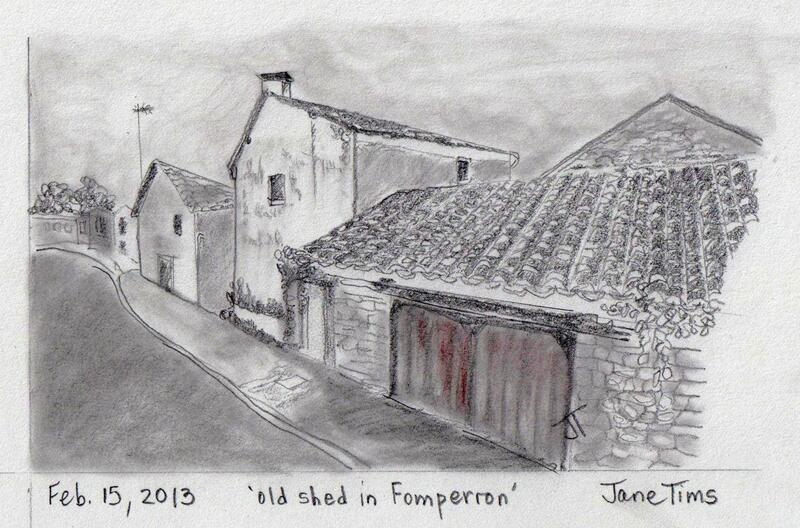 My bike ride for February 16 started in Fomperron, France. Imagine my surprise to see a donkey watching me as I biked by an old shed on the outskirts of the town! 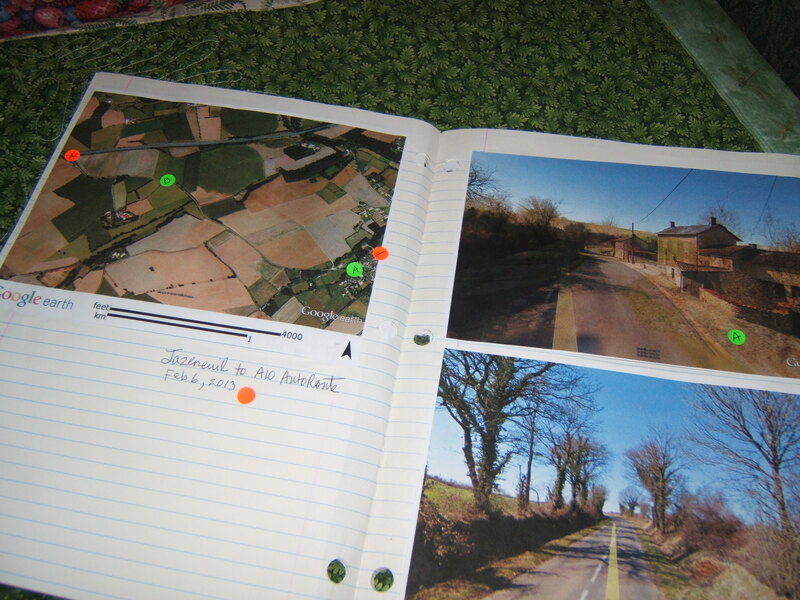 Notes: Took a side road not on the Street View grid, so I travelled ‘blind’ for a day through uncharted countryside. 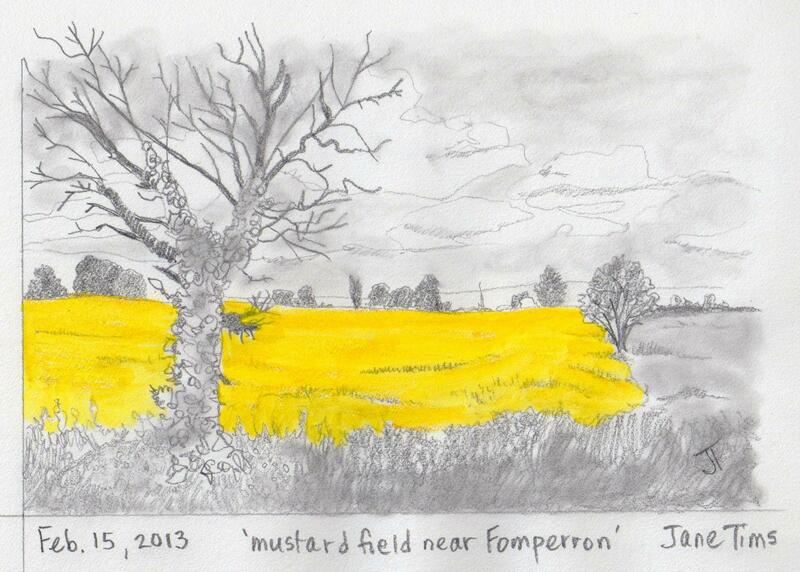 Notes: Travelling ‘blind’ for a day through uncharted countryside. Notes: Did a lot of walking this trip because I have a bad cold. Rejoined Street View at intersection and glad to be able to ‘see’ the road. First time I’ve seen a subdivision or a cemetery. This virtual bike trip has really worked to encourage me to exercise. I am going to keep going! 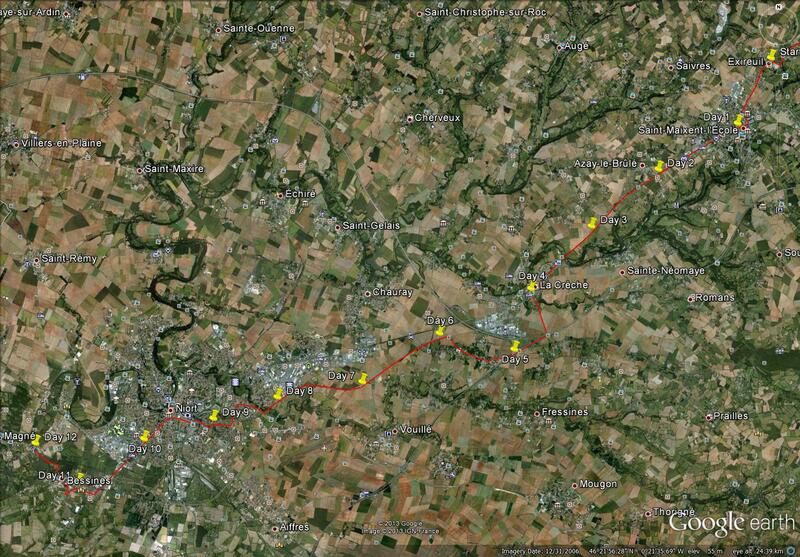 For Phase 3 of my trip, I plan to bike in 12 days from Exireuil to Magné just beyond Niort. 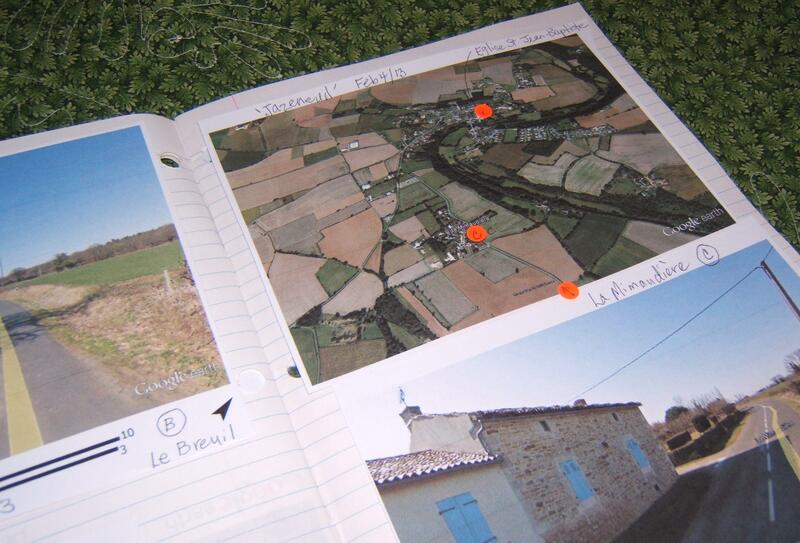 Follow me in Phase 3 to see more sights in the French countryside, to see some more drawings and to hear about my virtual adventures! As I was working at my desk, my husband called to me. Through our stained glass window, he could see a silhouette of our grey squirrel. I’m glad the squirrel waited long enough for me to snap his picture! 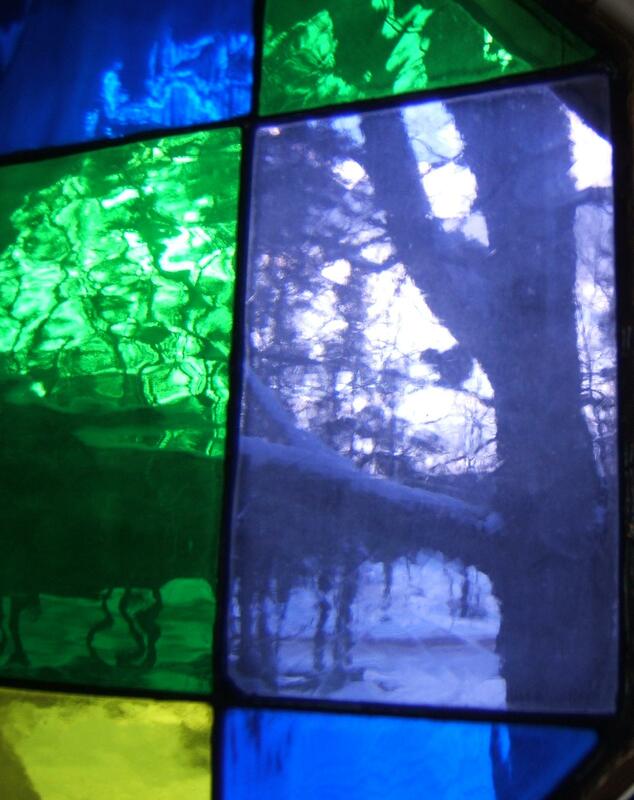 Can you see the squirrel through the stained glass? 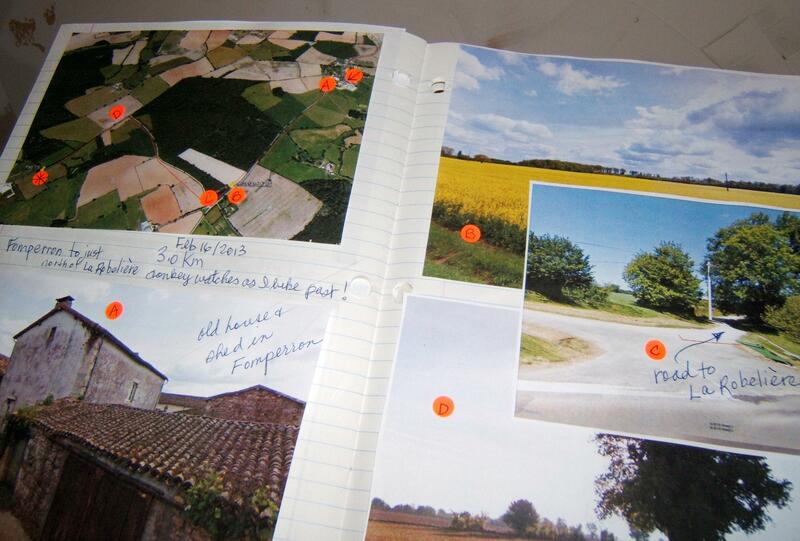 I am in the second phase of my virtual bike trip through central France. In this phase, I am travelling on my stationary bike from Sanxay to Exireuil, a distance of about 18 km. 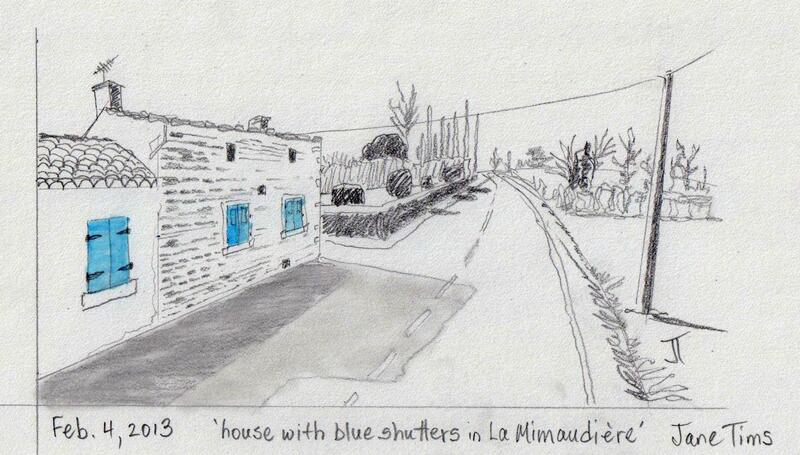 I began my Feb 13 bike ride in Mènigoute, France, a very neat and lovely town. I saw many trees in blossom since it is spring in Street View. 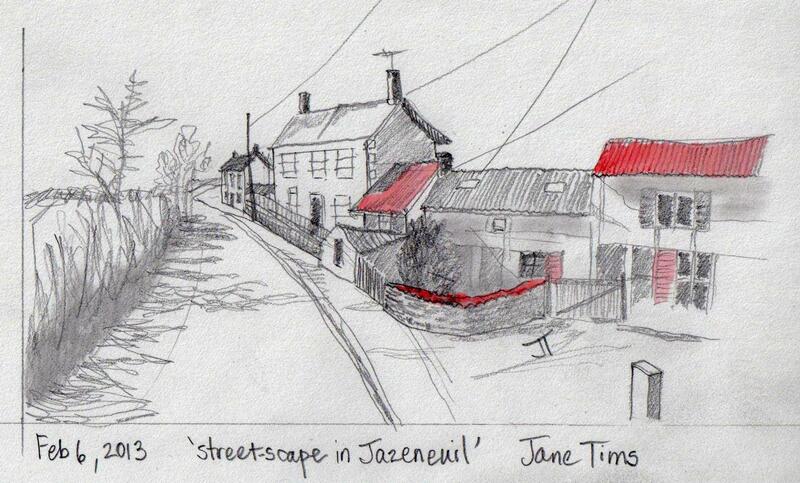 Most properties are fenced, or surrounded with hedges, and the streetscape is pristine. Some of the yards have gardens and very tidy compost bins. In the centre of town were two interesting churches. One, La Chapelle Bouchard, was in Gothic style, with intricate architectural features. 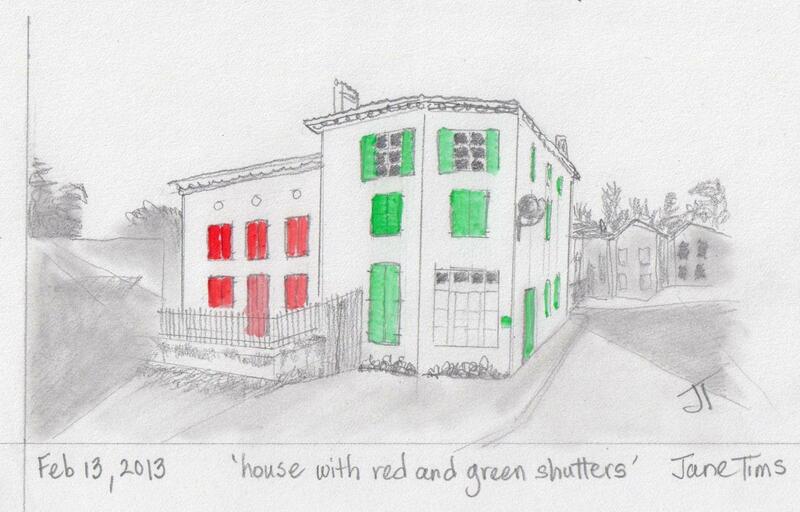 Across the street from the other church was an interesting house with red and green shutters. Functioning shutters are common on the houses. 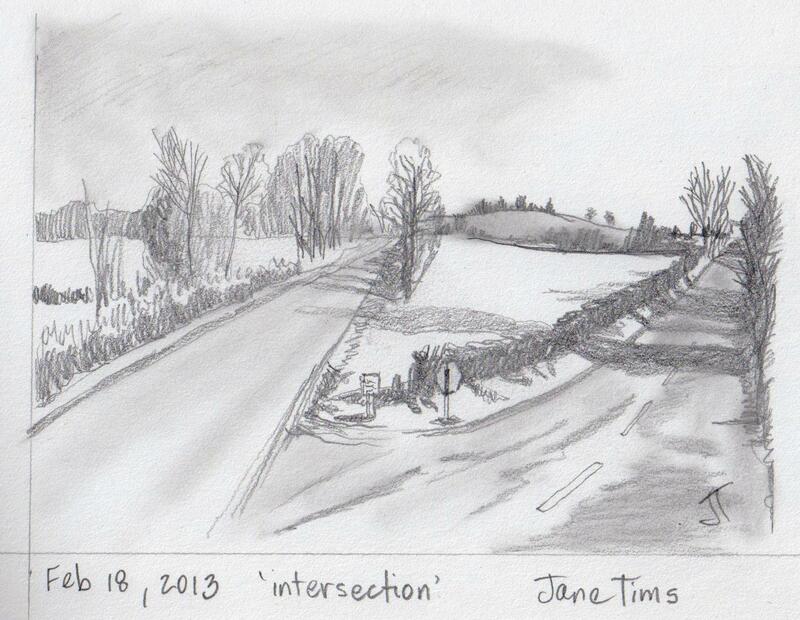 Notes: old oak trees line the roadways and dominate the hedgerows. In the countryside it is autumn, so I got an early glimpse of fall colour! 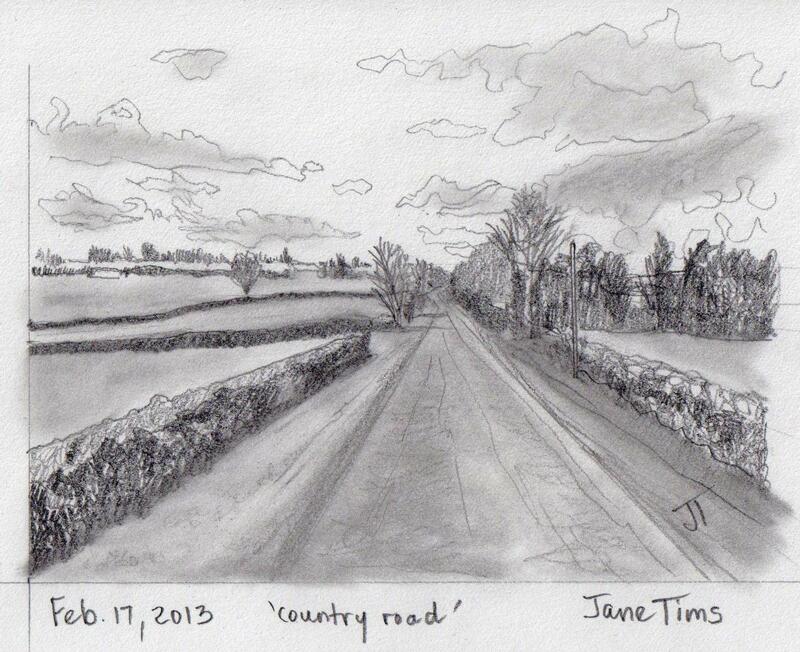 Notes: I was stuck behind a haycart for a while! 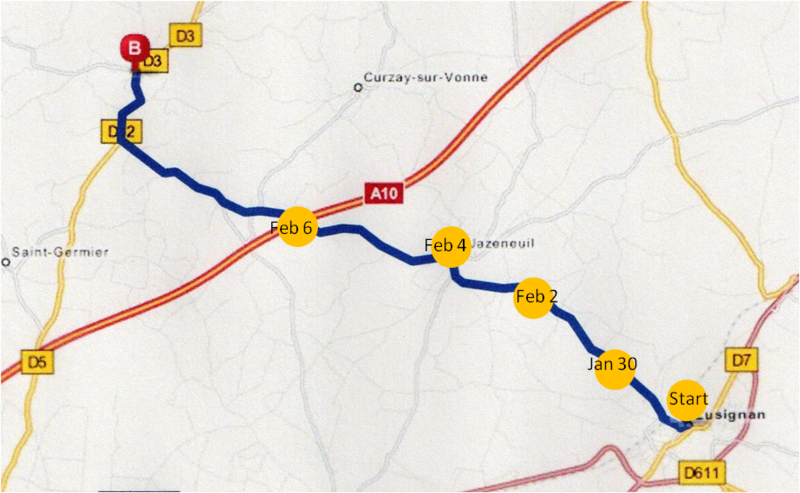 On February 12, I began the second phase of my virtual bike trip through central France. In this phase, I plan to travel on my stationary bike from Sanxay to Exireuil, a distance of about 18 km. One of the first features I encountered on my trip from Sanxay to the town of Mènigoute were mysterious plantations of trees. 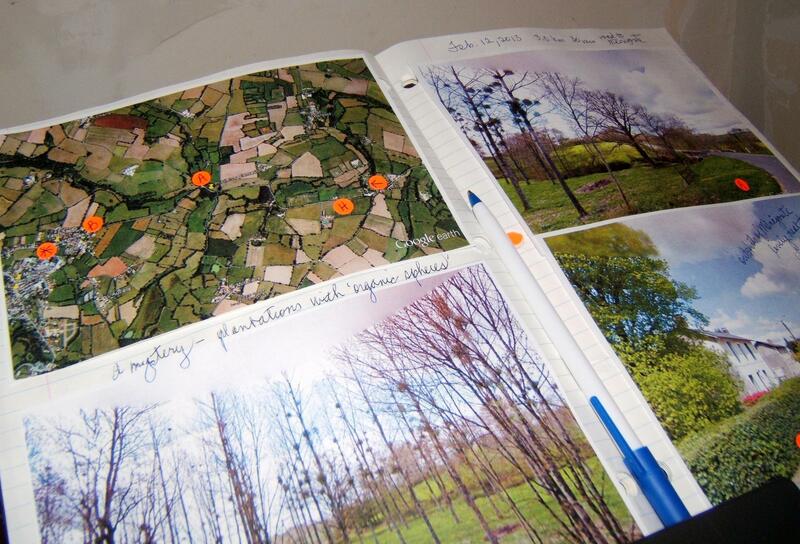 Street View shows lines of mature hardwood trees, leafless since the photos were taken in early spring. In the branches of the trees were green branchy spheres. 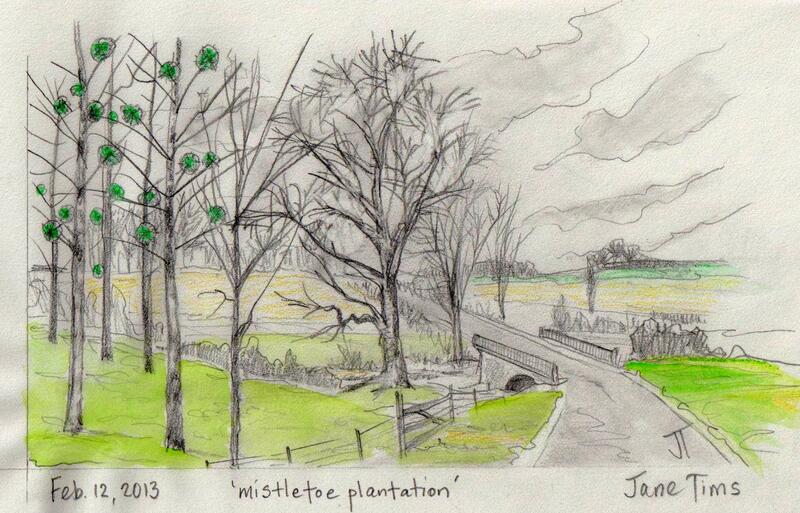 Encountering a mistletoe plantation during my virtual bike trip was truly rewarding!!!! Best view: plantation of hardwood mistletoe! 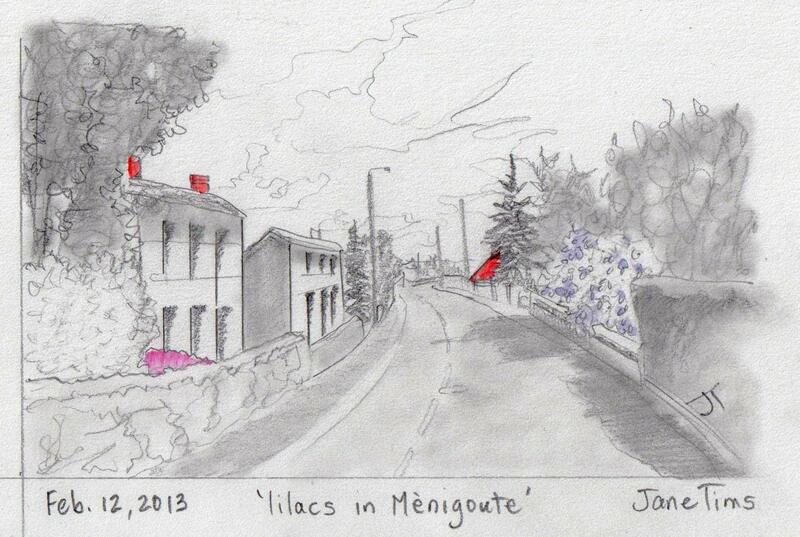 also, lilacs in bloom in Mènigoute! Notes: I also passed an area of archaeological interest… the Gallo-Roman ruins west of Sanxay – these include a Gallo temple, the Sanxay baths and a Roman amphitheatre. Have you ever seen a plantation of mistletoe?? 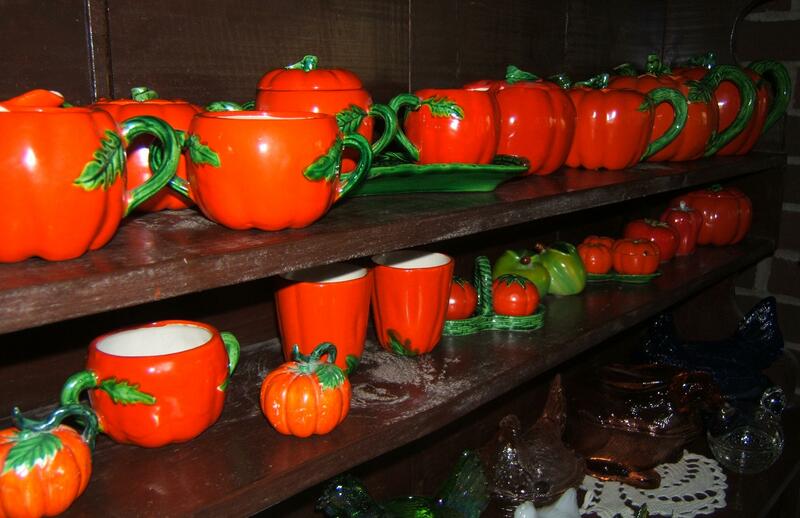 One of my favorite collections is my odd set of bright orange-red Tomato Ware dishes. They are usually marked ‘Made in Occupied Japan’ or ‘Made in Japan’ and were made in the late 1940s and the 1950s. Two of my pieces are marked Maruhon Ware (with a K surrounded by a circle). Maruhon Ware was made from the 1920s to 1950s. ‘Made in Occupied Japan’ means the piece was made from 1945 to 1952. 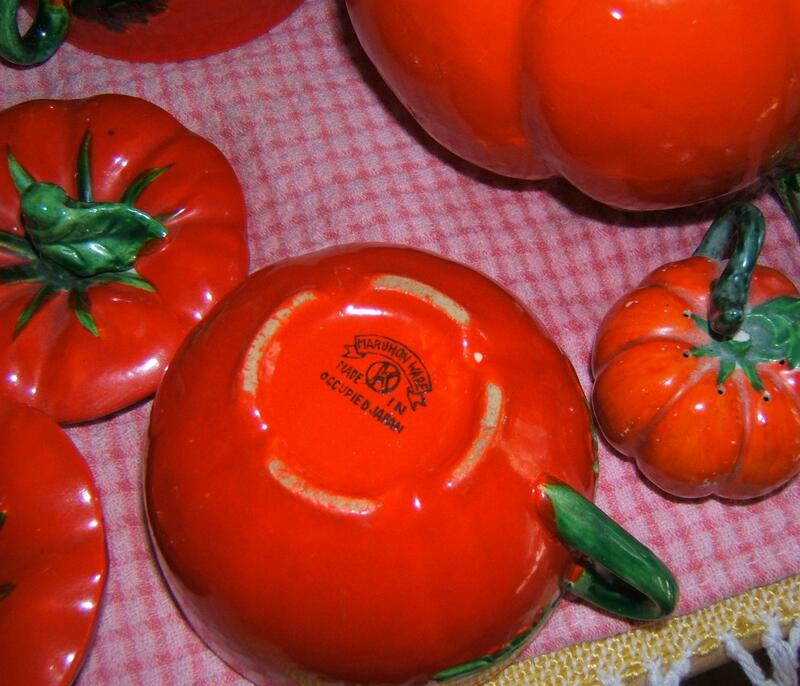 The pieces in my collection are shaped like tomatoes (I have one set of salt and peppers shaped like long peppers). 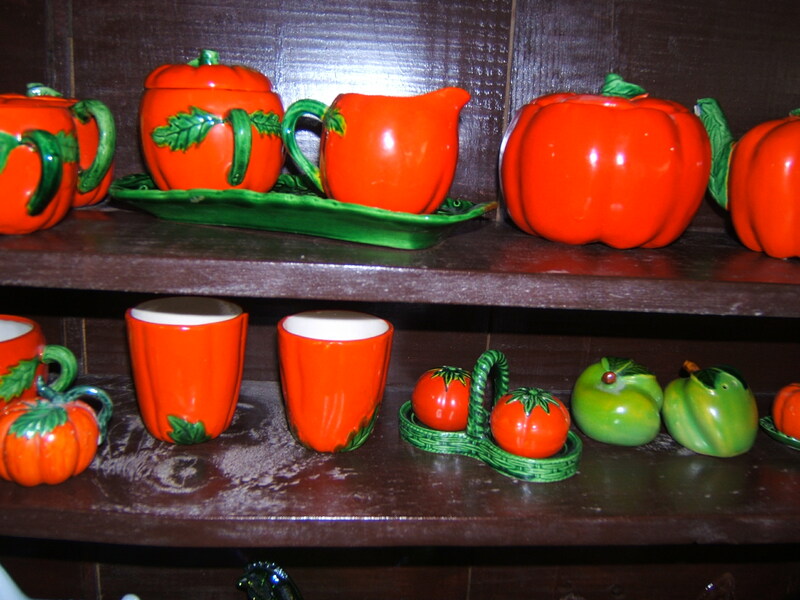 They are glazed pottery, coloured in an over-bright green and an orangy red. 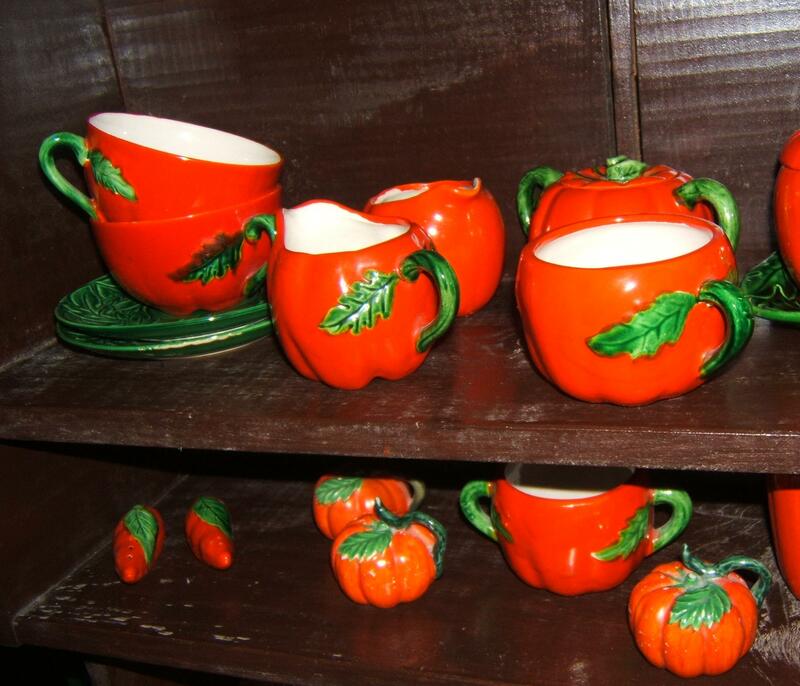 Most have green leaves as decorations, clasping the base of handles or teapot spouts. My collection is in good shape, the only flaws being a large chip out of the spout of one teapot and a broken handle on one creamer. The dishes are very bright and provide an accent color for my very green living room. 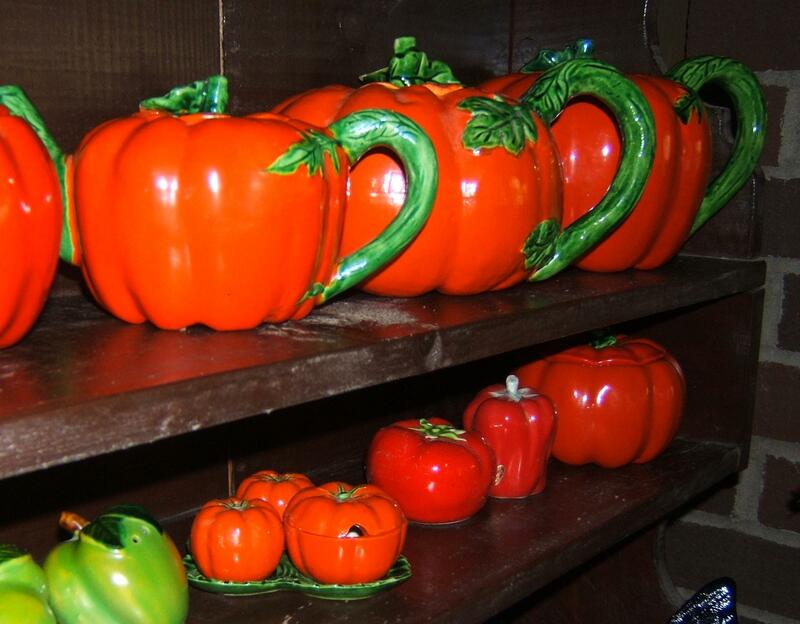 Do you have any pieces of Tomato Ware? 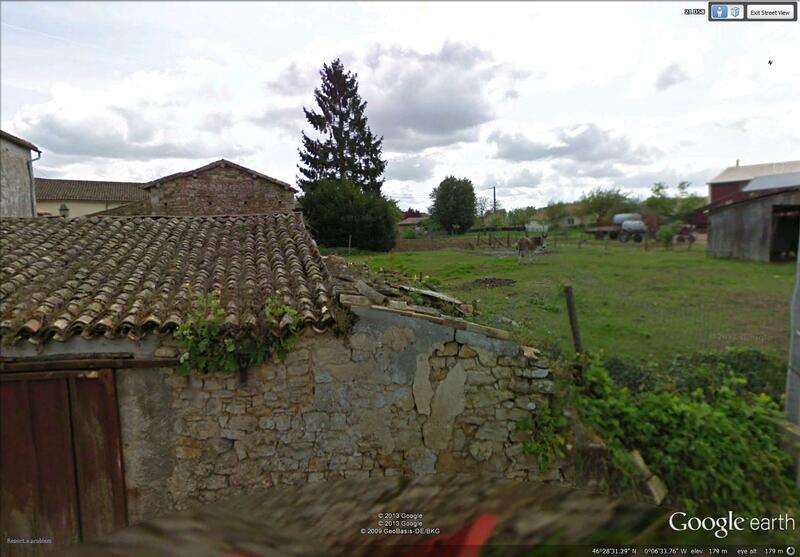 Another day of my virtual bike ride from Lusignan to Sanxay, France. 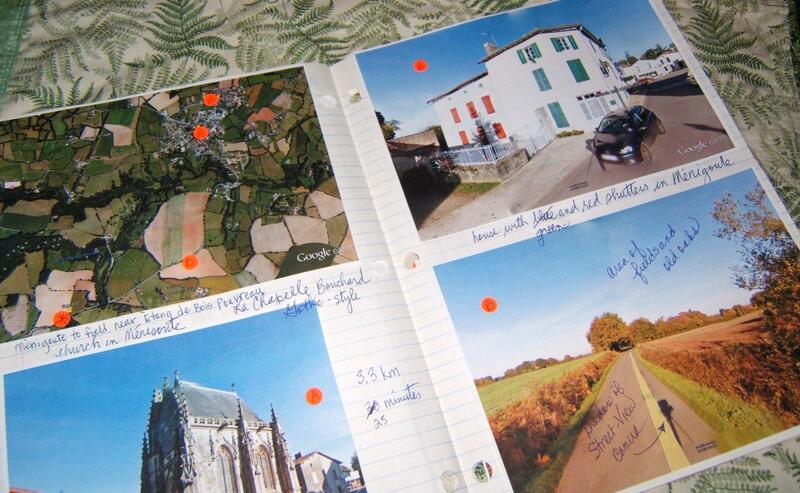 I hope you enjoy my silly comments as I make my way through the French countryside! 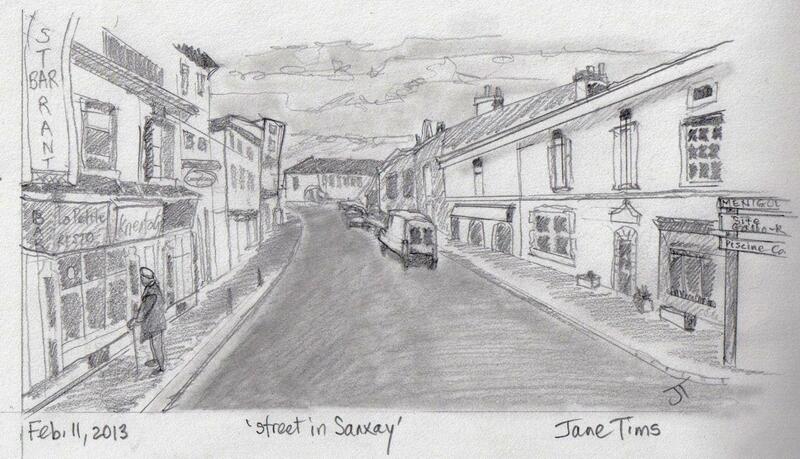 I am really enjoying making my drawings of the sights along the way. 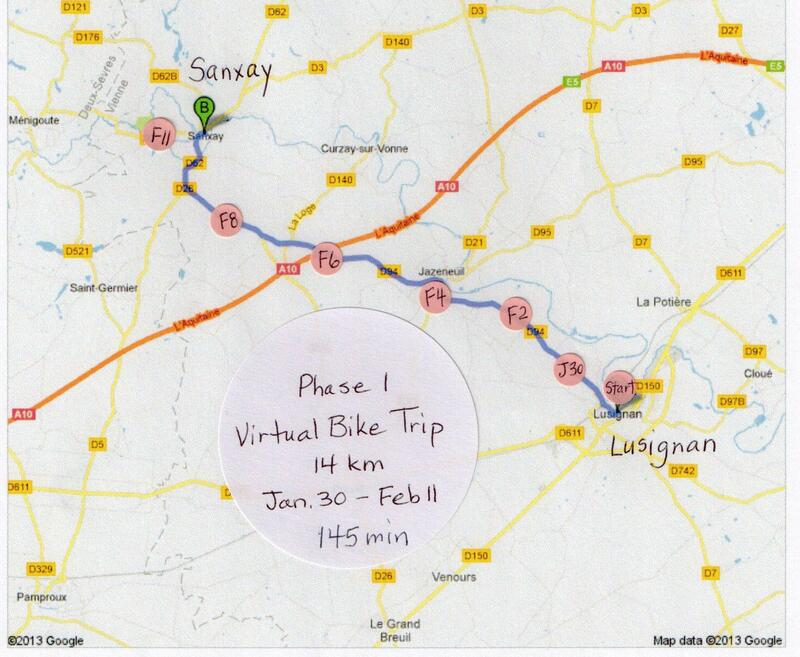 As you will see below, on February 11, I completed the virtual bike ride to Sanxay. The incentive of the virtual bike ride and reporting on my progress has really helped me – I have used my stationary bike more often and for longer sessions! Notes: Such a brisk day, I got off bike and walked for 5 minutes! 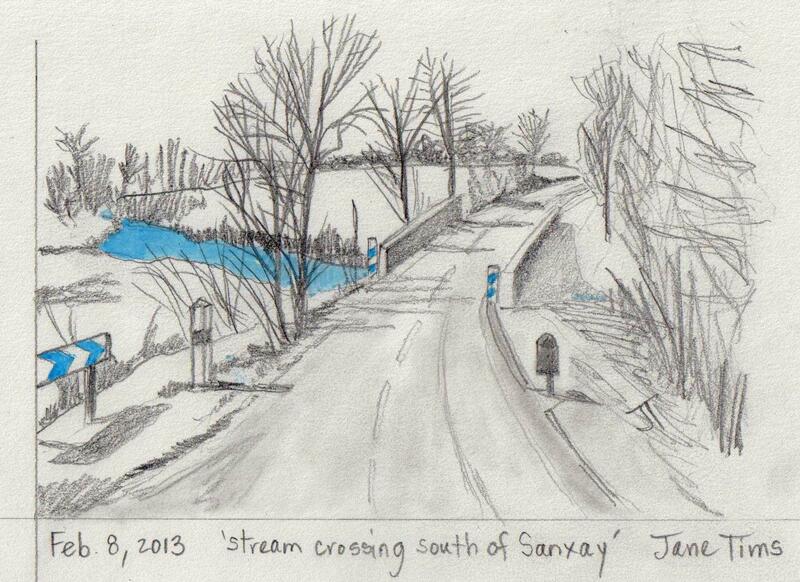 Notes: No wind and a flat country-side made for an easy ride to Sanxay! I did notice that when I began it was early spring (no leaves on trees) and when I finished my ride today, it was early summer (trees fully in leaf). The cause is not my slow biking, but different photography months in Street View! 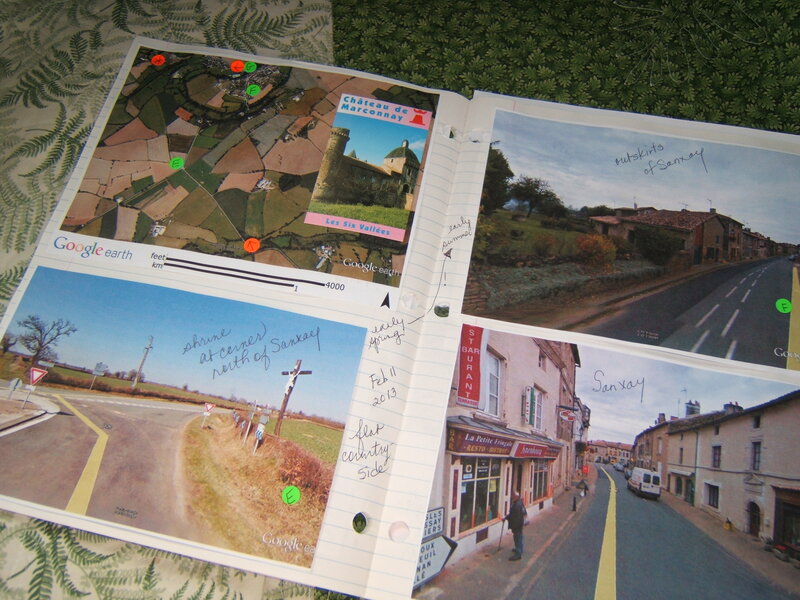 I have decided to push on, toward the town of Exireuil, about 16 km to the south-west of Sanxay. Do you know the way to Sanxay?????? 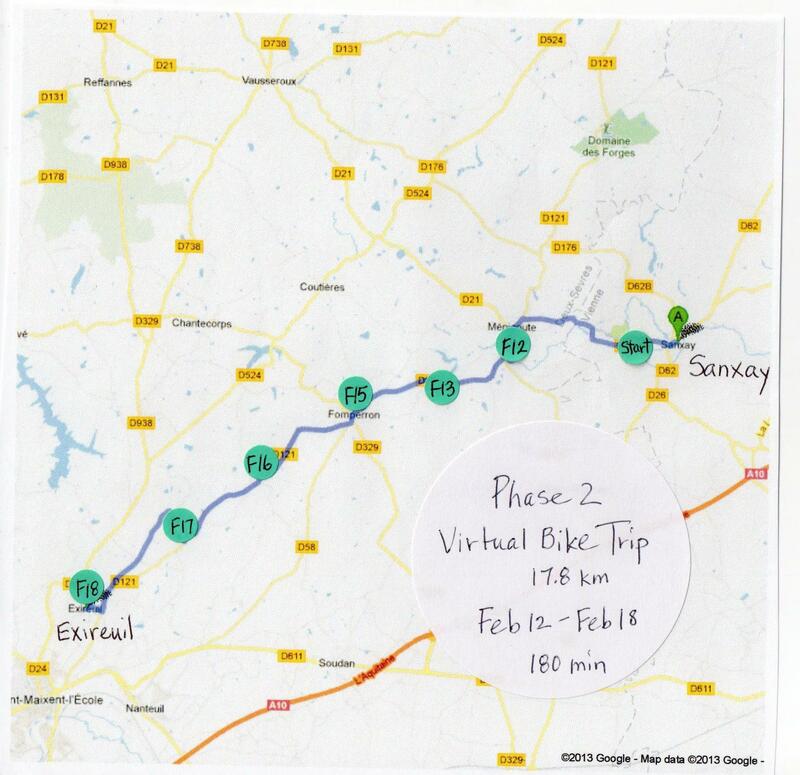 I am continuing to enjoy my new exercise plan – a virtual bike trip from Lusignan, France to Sanxay, France on my stationary bike. I am also biking further each session. 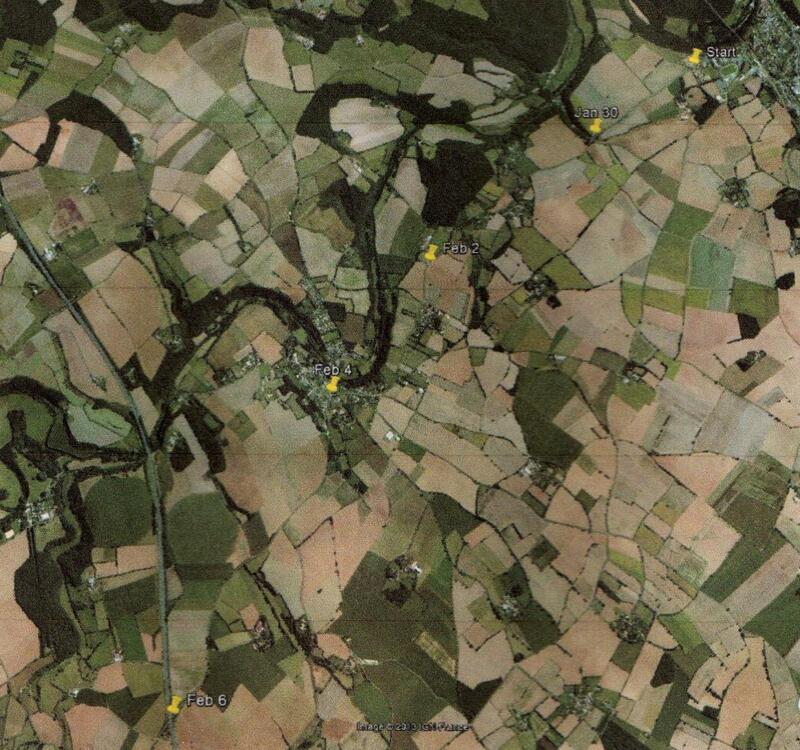 I have also discovered a new tool in Google Earth, a way to ‘pin’ my progress on the map by using ‘placemarks’. Notes: The traffic on A10 was horrible. I am glad I decided to bike the back roads! Have you ever been to this part of France?